Andrew Mowbray, Another Utopia, LaMontagne Gallery, Boston, MA, 2013. Boston-based artist Andrew Mowbray works across the mediums of sculpture, installation, performance, photography, and video. Mowbray received his BFA from Maryland Institute College of Art and MFA from Cranbrook Academy of Art. His work has been shown at locations including LaMontagne Gallery (Boston, MA), DeCordova Museum and Sculpture Park (Lincoln, MA), the Davis Museum at Wellesley College (Wellesley, MA), Gallery Diet (Miami, FL), the Institute of Contemporary Art at Maine College of Art (Portland, ME), and ArtSpace (New Haven, CT). 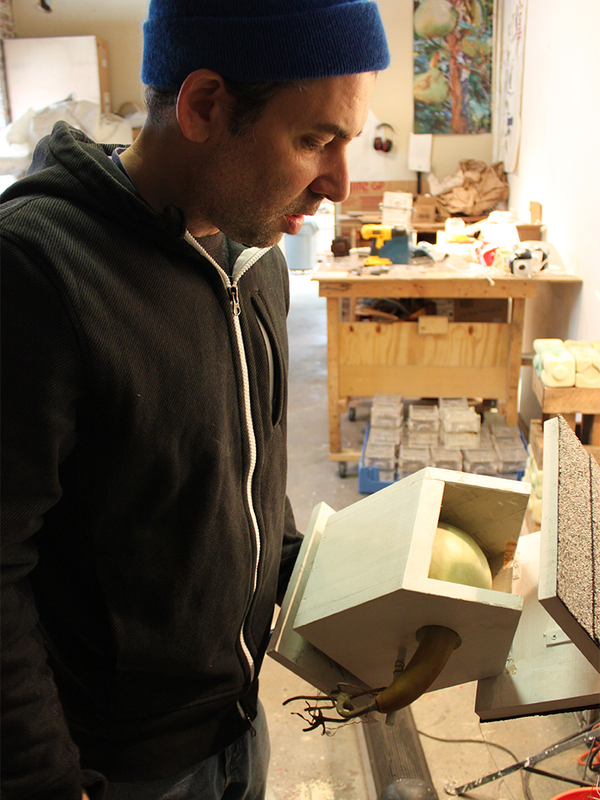 Mowbray was recently awarded a Massachusetts Cultural Council Artist Fellowship in Drawing, and his work has been featured in, and on the cover of Sculpture Magazine. I don’t exactly remember when I first came across Andrew Mowbray’s work; it seems as if its presence has always been in the back of my mind. I had the opportunity to get to know Andy while teaching at Wellesley College a few years ago, and I’ve keep a close eye on his surprising and innovative work ever since. 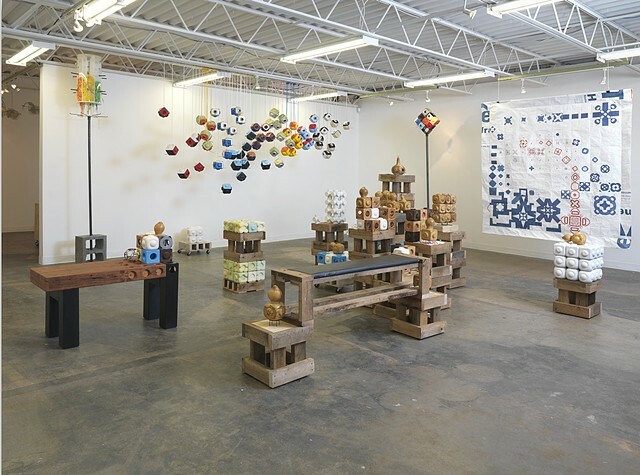 I knew about Andy’s interest in gardening and his experiments with growing birdhouse gourds, but was totally blown away (and terribly jealous) when I saw his most recent show, “Another Utopia”, at LaMontagne Gallery (which we also featured in our Exhibitions section on Temporary Land Bridge). While some elements from his studio were installed in the gallery, it was a delight to see everything in action in his studio space. We talked about his current work and the next growing season (and artwork) to come. 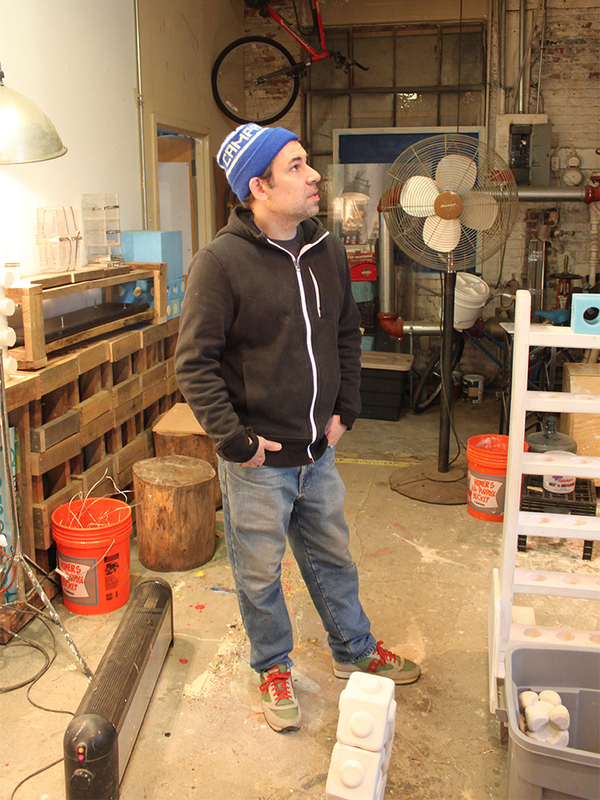 Andrea Evans: Hi Andy, thanks for the opportunity to come by visit your studio. I want to start with your recent exhibition, Another Utopia, at LaMontagne Gallery in December. You showed a new body of work that revolves around cured Lagenaria gourds that you have grown from seed and shaped with acrylic forms into modular structures that can be stacked or interlocked. In addition to the gourds, the work has branched out to include cast and carved modular forms that interlock with the gourds, cement birdhouses which reference a common use of this type of gourd, as well as supporting benches, shelves, and other structures. Where did this body of work originate, and how did it develop into what you put together for the exhibition? Andrew Mowbray: A few years ago it started with a cucumber that grew in my garden fence. This cucumber form, and what it was doing intrigued me. I wanted to make it permanent, so after some research I found bird house gourds which can be formed and dried, and the project developed from there. I have been working on this idea for a while and I have always been thinking about what is next. The exhibition felt a little bit like a layover because I have just been preoccupied with how my objects can potentially function in the future and what they can be next. AE: Where does the title “Another Utopia” come from? Is there a utopian vision or ideal at the core of this project? AM: The title of the project came about because it dawned on me that this project might have great practical architectural potential. As the grown modular formed gourds began taking shape, they became aesthetically very reminiscent of the ones created during early modernism. With that I realized my Utopia is not everyone’s, like all utopian dreams. At least my Utopian imposition has just been on backyard flora and fauna. AE: In some of your writing about your work, you state that you “create objects that have a use”. Do you have a specific idea for the potential use of these modular gourds, and the structures and objects that interact with them? AM: Yes! I am still open to these being everything from furniture to architecture, containers, and some other top-secret stuff that is still in the works. 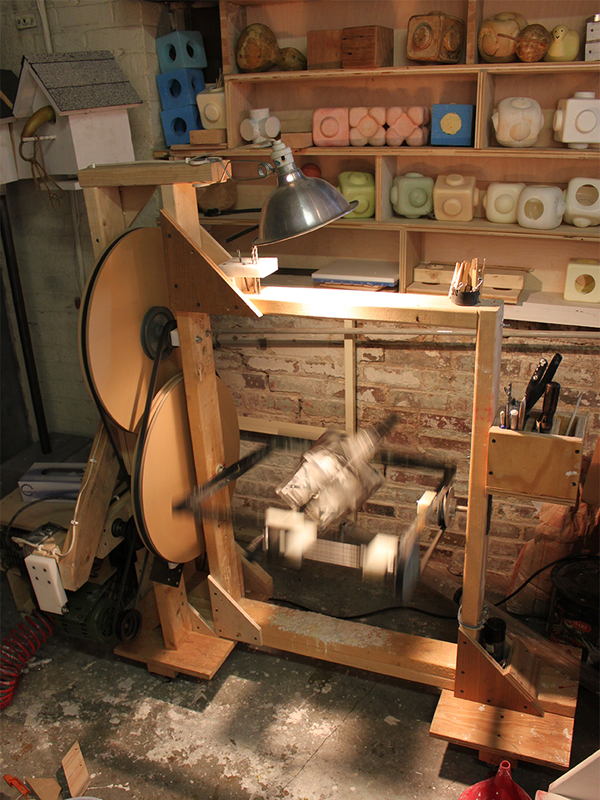 The amazing machine that Andy made to create modular forms out of plaster, cement, and other materials. The machine spins the form so that the material is disbursed evenly. AE: Through your work with the Lagenaria gourds, your studio has really been extended to the garden, and your practice now relies heavily on the growing season, weather, and of course, a good amount of patience and luck. Have these restrictions had an impact on other aspects of your studio practice? AM: Sometimes I feel it is difficult to give people a clear view of how it all fits together during studio visits, (like yours) because there is always work in various stages and in many locations depending on the season. As the growing season begins or ends, there’s a lot of forethought, clean-up, as well as overall preparation, but in general it has been really nice, and working outside in the summer is great! Andrew Mowbray, Gourds in forms on arbor, Lagenaria gourd, acrylic, stainless steel, 7″ x 6″ x 5″, 2012. AE: In our visit, you made a comment about your work in “Another Utopia”, that you didn’t want any kind of hierarchy between the different materials and forms that you used, that you wanted them all to “get along”. This show definitely had a pretty diverse range of materials, including the cured gourds, the plaster and cement forms, wood structures, birdhouses, tyvek quilts, all side by side. Everything you make has a high level of craft and great sense of design, but there’s something about the incorporation of natural materials (even highly manipulated natural materials), that gives this work a kind of diy/urban homesteader feel, versus the pristine and sterile quality of your high density polyethylene pieces. What drives your choices in materials throughout different bodies of work? AM: My thoughts have shifted, but the work has always existed in two worlds: the natural and the gallery. It is just more in the natural now. 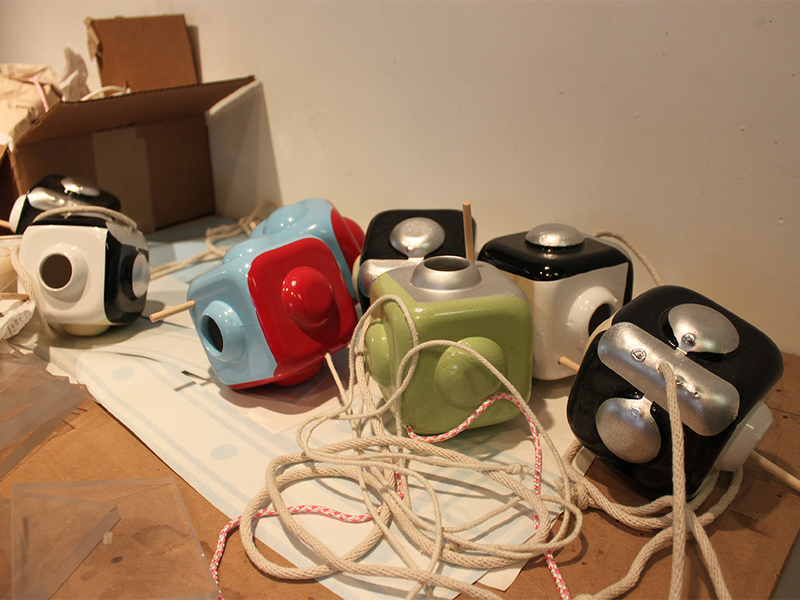 Usually the polyethylene objects I created felt more comfortable in the gallery. I consider both the objects and the gallery space synthetic. I created the objects in my studio, performed with them in “nature” or outside, and the performance documentation and objects eventually were displayed back in the white cube. Andrew Mowbray, Tempest Prognosticator, performance/video still, 2008. 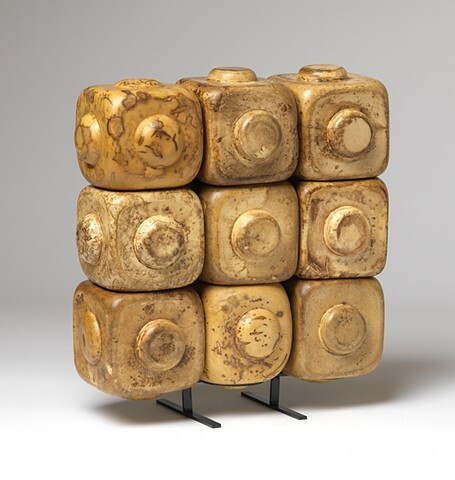 I some ways now I am creating synthetic plastic cubes, “molds for the gourds” in the studio, then placing them in nature and making the natural materials conform to this artificial modular geometry, and placing these objects in the gallery. In the exhibition, Tempest Prognosticator, I was potentially an artist representing a leech in a jar; now the formed gourd potentially represents an individual or maybe an individual architectural space? When it comes to the choices of material with this project, it was all about availability, reuse and the challenge of making materials fit the parameters. When it comes to polyethylene, it’s plastic, but it’s still expensive. AE: Speaking of “Tempest Prognosticator”, throughout much of your work, you have made objects that become activated by your body, or that utilize your body in one way or another. In the piece, “Tempest Prognosticator”, your body becomes the central pole of a sculpture/machine that records atmospheric conditions. 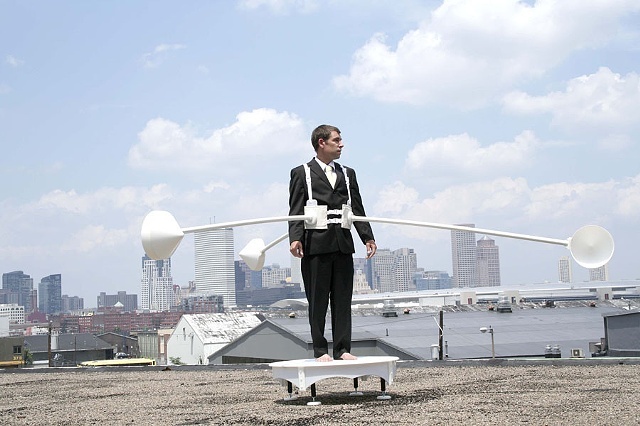 Another example I think of is “The Curator”, a kind of large-scale divining rod that you used to locate particular places within the gallery to install your work for an exhibition. 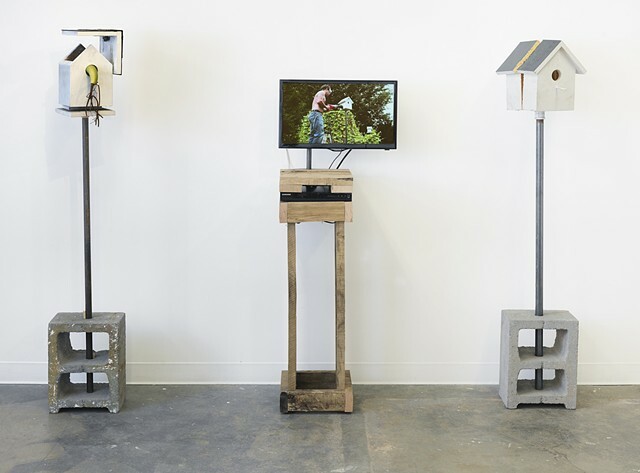 Andrew Mowbray, The Curator, high density polyethylene, 41″ x 25″ x 1″, 2011 (left), The Curator, video still, 2011 (right). Of course, there are also your pieces that directly reference well-known works of performance art, such as “Just for Men”, which reinterprets Janine Antoni’s “Loving Care” performance through a male perspective. In “Another Utopia”, it seems that you, as the artist and performer, have become a little less front and center. Was this an intentional shift? Do you still see these works as performative in some way? Andrew Mowbray, Just for Men, video stills from performance, 2005. AM: I have the one video in the exhibition to reference Gordon Matta Clark’s Splitting work for various reasons, but beyond that, this work is more performative than others I have done. Just to get the modular forms on the growing gourds up in the arbor is often a feat of engineering, surgery, yoga, and a loud free form verse of curse words. Then there is the nightly pollination assistance because the gourds produce both male and female flowers that only bloom in the evening or at night. So needless to say, I spend some time on a ladder in the dark with a Q-tip and flashlight going from flower to flower spreading the pollen. Basically I see everything that is physical and has movement in relationship to a project as performance. I don’t always choose to document these because they may be boring or I don’t want to focus on them. 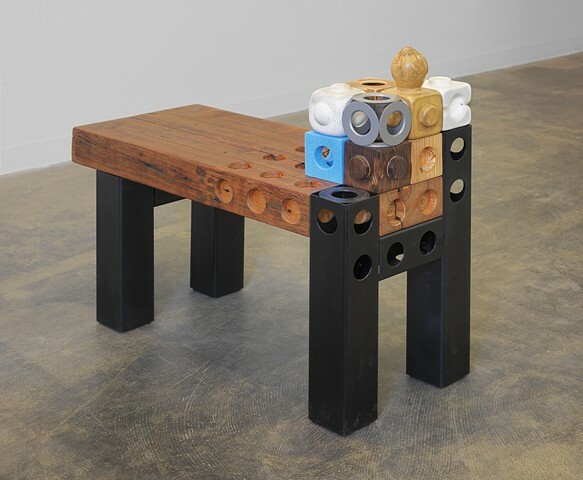 Andrew Mowbray, Splitting 2013, 6′ x 8′ x 1′, 2013. AE: In your studio, we talked about how your different bodies of work have touched on the concerns, values, and aesthetics of past time periods and art movements. For instance, the “Bathyscape” work has a strong Victorian sensibility, and your current work in “Another Utopia” seems to pull from the Arts and Crafts Movement and Modernism. Can you elaborate more on these connections? Do these shifts within the work simply reveal changes within your own personal interests and aesthetics, or do you feel they reflect large-scale shifts in the concerns of contemporary culture? AM: This is a question I ask myself. Is it a “sensitive artist” thing? Do we tend to pick up on larger trends in society? I have noticed parallels with past times with my work but I feel these parallel relationships are more progressive and that time is faster now, with current relationships to the past being more condensed. The Victorian Era in some ways was similar to late 1990’s and early 2000’s, with greater gender equality, more wealth, but greater discrepancy in relationship to class. Also a greater understanding of science and the biological world: Darwin= genome. Now we are in D.I.Y. period, which reflects The Arts and Crafts Movement by embracing traditional forms of creation, and also the new D.I.Y. industrial processes such as laser cutting and rapid prototyping. These post-industrial times share an awareness of our impacts on our environmental surroundings and also a grassroots “making this happen attitude” which is readily reinforced by the internet, crowd funding, and social media. 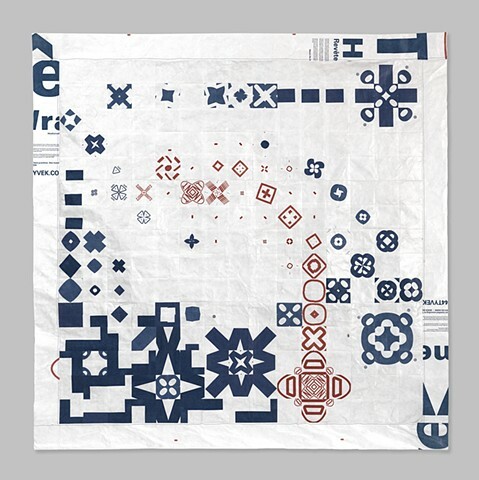 AE: Alongside your other bodies of work, you have an ongoing series of quilts that you make out of Tyvek, a material used in building houses that acts as an air and water barrier. When and how did these pieces start, and what keeps you invested in this series? AM: These started with seeing the Tyvek material on buildings and thinking it looked quilted, which led to thinking about the home in relationship to traditional gender roles and ideas of quilts/insulation, interior/exterior. I also just like creating flat work with a three-dimensional construction thought process. They are fun to make and I like to sew, that is why I keep coming back to them. Tyvek is also actually made of a plastic that is similar to my other work. AE: The quilts bring up another aspect of your work that I’ve been thinking about. I’m curious about the ways in which your work overlaps into other fields beyond the art world. Your Tyvek quilts have been included in quilt-making books, you have gained recognition in the gourd-growing community, and your cement birdhouses could easily find a home on Etsy. This certainly attests to the breadth of your research and process, and has allowed you to expand your potential audience. Does this also change the way you view or define “art” (both your own, and art in general)? AM: I really just look at everything from the different aspects that traditionally have defined art, architecture, design, and craft, but I try not to think about these as individual separate disciplines. Placing a hierarchy and/or defining elements, materials and construction techniques as “craft” or “architecture”, “high” or “low” can be limiting. AE: You also just created a new work for Victoria Mansion in Portland, Maine. 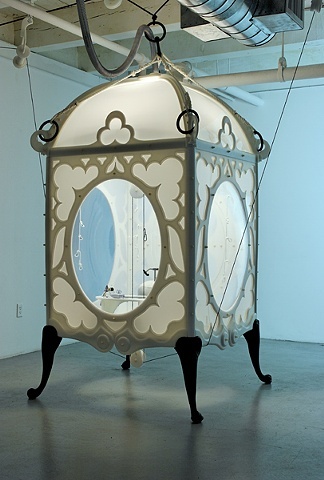 This piece connects in some ways to your earlier works such as “Bathyscape”, “The Other One”, and other highly ornate polyethylene plastic works. Can you tell us more about the project? 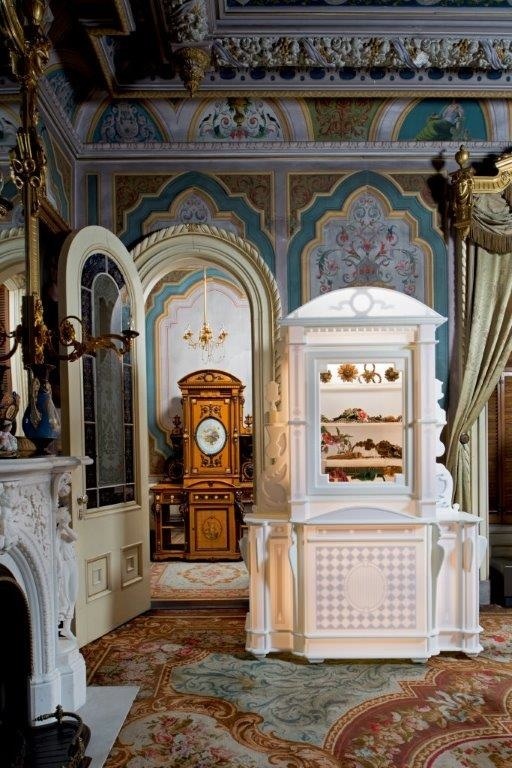 Andrew Mowbray, Untitled, polyethylene, polycarbonate, original Victorian Mansion silk trimmings, nylon, fluorescent lights, 8′ x 5′ x 25″, 2013 (installed at Victoria Mansion, Portland, ME). AE: It looks like we are finally, slowly but surely digging our way out of winter and into spring. You are currently curing gourds from last season and planning for the upcoming growing season; what’s ahead for this project? What other things do you have on the horizon? AM: I have a lot of I ideas. 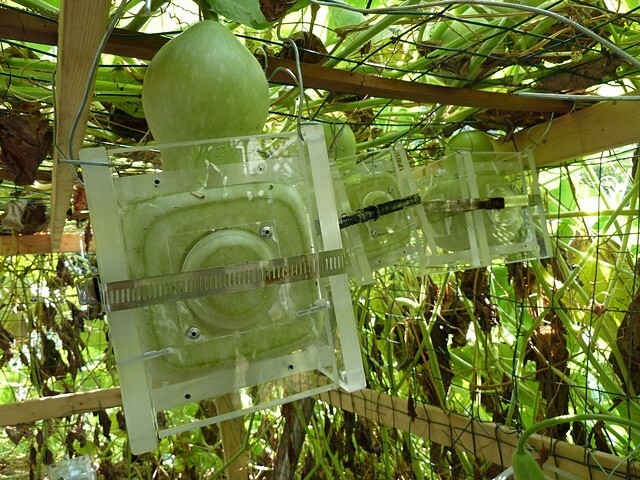 I will introduce a new modular mold to grow gourds in, which will be modular with the past seasons. I still need to build these and have them ready for around June. The rest is secret. I am looking forward to having you by to see gourds. Thank you! 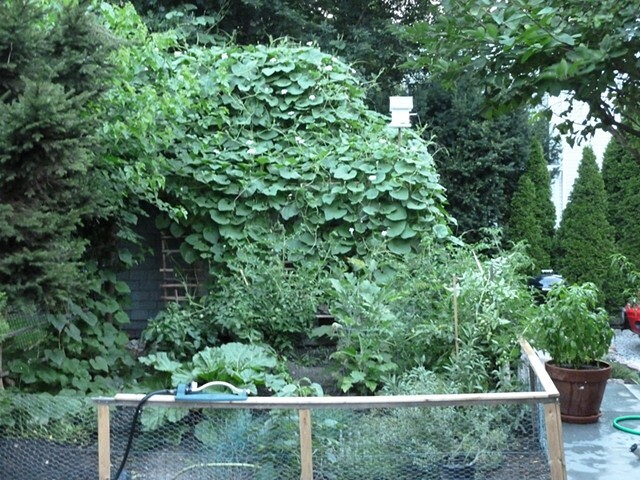 Andrew Mowbray, Garden, full gourd vine growth covering shed, 2012. AE: Thanks for your time! I can’t wait to come visit your garden this summer when everything is in full swing. Tags: Andrew Mowbray, Another Utopia, installation, Lagenaria gourds, performance, Performance Art, quilts, sculpture. Bookmark the permalink.